Fanny Keifer questions Tulshi Sen "If your doctor said, "You know we have done all the math, pretty much you have a year or two to live, how would you handle that?" Watch the video to see Tulshi Sen's life changing response. 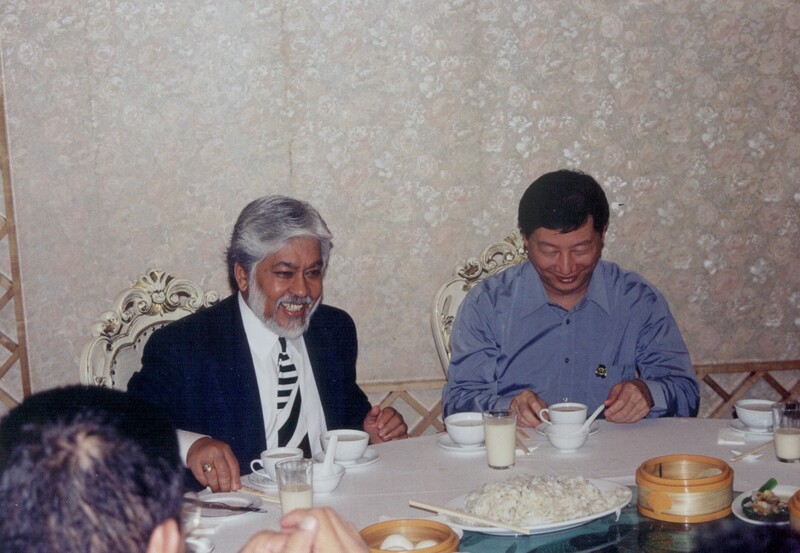 Mr. Jiang Hong, The Govenor of Yang Jiang City , People's Republic of China, and Mr. Tulshi Sen at a breakfast meeting hosted by the Government during negotiations of a Joint Venture Proposal in China. 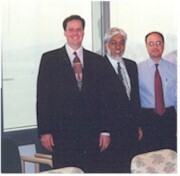 Tulshi Sen, center, and his associate Neil Thompson, Chartered Accountant, left, with Senior Trade Commissioner Mr. Michael Fine, far right, in Hong Kong Canadian Consulate office overlooking Victoria Harbor, after briefing the Canadian Post in an official meeting about the Canadian First Nations Pavilion in Hong Kong. Tulshi Sen With Right Honorable Lloyd Axeworthy, formerly Minister of Foreign Affairs of Canada at the International SME World Expo in Hong Kong along with Canadian Contingent. "Another area Mr. Sen has excelled in is the development of comprehensive training programs and services. After working thirty years in the socioeconomic development field I have never come across training programs that meet so directly the needs of Aboriginal Clients. Mr. Sen's approach is a sensible one that gets to the very roots of economic development for developing communities." The Consul General of Canada in Hong Kong Mr.Colin Russel and Mr. Tulshi Sen discussing the evolution of Canada's first Trade Pavilion at the 2000 Hong Kong Gift & Houseware Fair and Premium Show. Mr. Tulshi Sen and Mr. John Braga, Manager of Incoming Missions of the Hong Kong Trade Development Council, discuss how the Hong Kong Trade Development Council can best help his students develop Trade Relations with the Hong Kong Business Community. 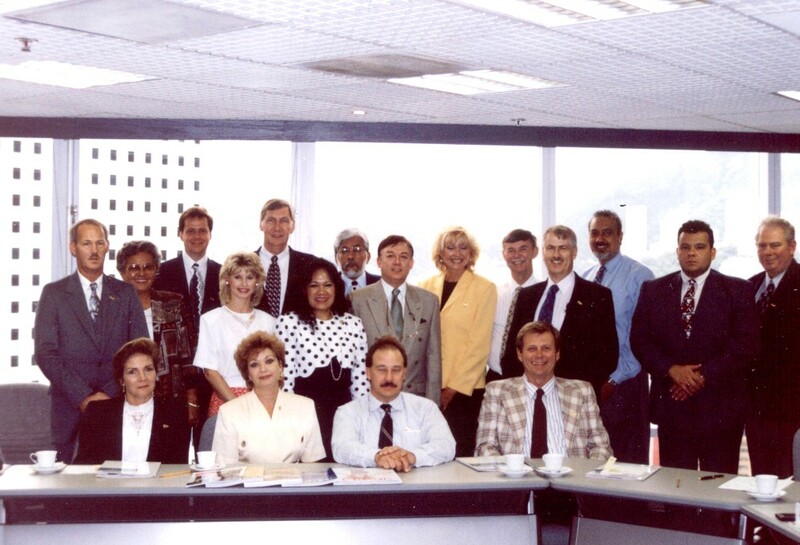 An American delegation being greeted by the Hong Kong Trade Development Council, the trading arm of the Hong Kong Government, in their board room. Tulshi Sen with Vice Consul of Canada in Hong Kong, Ms. Nancy Bernard. 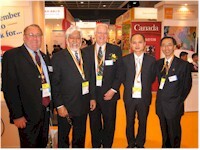 From left: Bob Armstrong, Senior Vice President Government Affairs of Canada, Tulshi Sen of Tulshi Sen Consulting, Robert Brown, Executive Director of the Hong Kong Canada Business Association, Andy Chan of Tulshi Sen Consulting, and Andrew Yui, Director Canada HKTDC Toronto Office. On a cold wintry night, he Came to Canada with a suitcase and four hundred borrowed dollars and a dream. He built an enterprise, and built businesses for individuals right across United States, Canada and around the world. He Brought vision to those who did not have the confidence of visioning larger than themselves. He inspired them with his personal experience to build a better life and build enterprises to be free. He gave them ideas and showed them how to develop the ideas into businesses. He developed Business plans and showed them how to implement it. He not only taught how to build visions and how to live their visions to those who felt boxed into a nine to five cubicle basedlife, he also personally took them by the hand and raised their consciousness into unknown heights. Tulshi Sen is world renowned for being on the cutting edge in this field. Wherever he is, doors and opportunities open as if by magic for his students. He is, himself, a successful entrepreneur, importer/exporter, manufacturer and teacher. He took them from the consciousness of earning a side income from a part time business to the great halls of businesses in Hong Kong, Taipei and Guangzhou, Shen Zen and Guangdong in The People’s Republic of China. He made them able to do things that they never dreamed of. He took them to be welcomed as equals by great organizations such as The Hong Kong Trade Development Council and Hong Kong Chamber of Commerce et al. He has touched thousands of lives and taught them the spirit of enterprise. He has made… the apparent impossible possible. Not only that he was invited as a result of his accomplishments to the largest Aboriginal Reserves in Canada where unemployment, suicide and teenage pregnancy is unusually high, where alcoholism is a chronic disease and helped to establish businesses and transform lives. He realized the root cause of the problems and saw the training had to be culture based as much of the issues were related to Residential School history. He went deep into the traditions and culture of the First Nations with the support and teachings of the Elders and built the program. The foremost Elder, past Chief and Medicine Man, Rufus Goodstriker, honored him with a Blackfoot Name in a Sacred Ceremony and inducted him into the “Lone Fighter clan”. No slow and gradual process can achieve the goal of self sufficiency under such social and economic conditions. He realized, that the only way to get out of such desperate conditions is to take a quantum leap. He visioned and helped to establish the First Chamber of Commerce among the First Nations of Canada. He helped to establish the first business incubator amongst the First Nations of Canada. In this reserve he has taught individuals who did not know how even a fax machine is operated to engage in International Trade, Manufacturing and Distribution. He then took them from the Reserves of Canada to the International Trading grounds of Taiwan, Hong Kong and Shenzhen, Guangdong, Guangzhou and other cities of The People’s Republic of China. 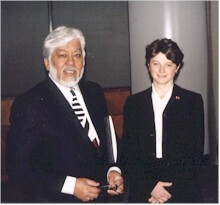 The word of his success spread and then he was invited by other First Nations to implement the same Program which led him to the halls of the Federal Government of Canada. 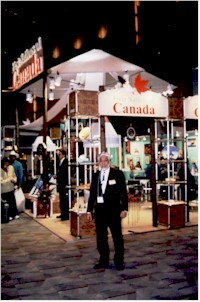 This lead to the culmination of the First Nations Pavilion of Canada at Asia’s largest trade show against overwhelming odds. 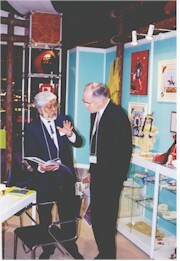 His vision further led to an unprecedented event… He convinced the Hong Kong Trade Development Council of staging ten cultural shows right in the largest trade show in Asia to promote the First Nations’ Pavilion of Canada. 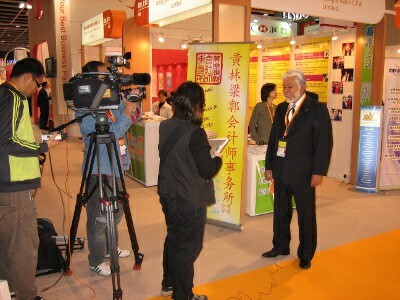 The whole world watched for the first time the cultural event of this kind at a trade show. This was truly a masterminded stroke of marketing genius.This was an announcement of his clients to the World and to Canada that they meant business. Tulshi Sen at the Opening Ceremonies with the Chairman of The Hong Kong and Shanghai Banking Corporation along with the Top Dignitaries of the Hong Kong Trade Development Council. 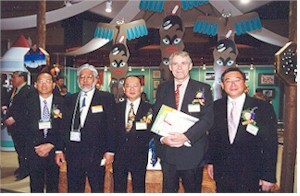 From left, Michael Sze, Executive Director, Hong Kong Trade Development Council, Tulshi Sen, the man behind the Vision, Edmund Young, Chairman, Hong Kong Premium Show Organizing Committee, David Eldon, Chairman of The Hong Kong and Shanghai Banking Corporation, and Jeffrey Lam, Chairman, Hong Kong Gifts & Houseware Fair 2000 Organizing Committee. He stood there himself in the Pavilion in Hong Kong and sold to the world. He took them from the Reserves of Canada to the Hub of International Trade to stand on their own right. 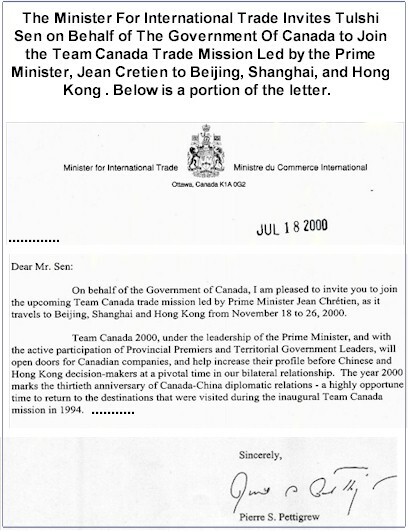 The Government of Canada invited him to join the Prime Minister Jean Chrétien as a part of Team Canada to Beijing, Shanghai and Hong Kong. He taught them how to tap into the World Market from the Canadian Aboriginal Reserves. 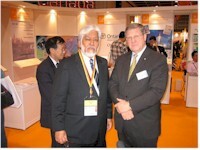 He also helped to build manufacturing, distribution and direct marketing businesses within the Reserves. If you never had the privilege of hearing one of the World’s foremost lecturers in the field of personal development, leadership and business development before – you are in for a real penetrating experience in the world of entrepreneurship. As far back as 1980, he designed the first Direct Mail Marketing Course in association with George Brown College and funded by the Federal Government. From conducting Trade Missions to the Far East to manufacturing a highly respected Polymer Marking Device Making System, this is a man who is at home anywhere in the world and in any business situation. Trade Missions To The Far East – International Doors Open For His Students! For over 35 years now, Mr. Sen has been showing budding entrepreneurs how to use today’s technology to build businesses from home while they keep their present jobs. His style and contagious enthusiasm take him all over the world at a breathless pace. When he says “the world is my home”, he means it! He is equally at home in the streets of Hong Kong, Taipei, China, Tokyo, London or America. On whirlwind Trade Missions in the Far East with his students, he helps them do everything from negotiating exclusive rights on products that haven’t hit the market yet, to making deals on prices and quantities they can afford. Then he turns up a few hours later at the glittering and prestigious cocktail parties of the Hong Kong Trade Development Council – taking his students with him! There, Tulshi and his delegates are warmly welcomed by the Council. 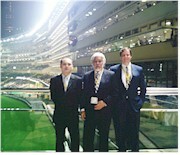 His students find themselves hobnobbing with the business elite from all over the world. Products, contacts and assistance, it’s all in a day’s work to him! On the home front, (all of North America in Tulshi’s case) his Marking Device System and his unusual marketing techniques have helped many to find success in their own Home-Based Business. Imagine A Marketing Plan that shows how to sell your own products successfully from home – without making a single sales call – in phone or in person. If you think that sounds incredible, you will want to hear him “live”. His unique ideas are just what you have been looking for! Tulshi Sen is highly respected internationally. His “on site” Business Seminars and Trade Missions to the Far East have helped many a budding entrepreneur make contacts and find products to put them on the road to success. Throughout Canada and the United States his marketing techniques and strategies have opened doors to many by showing them how they can stand on an equal footing with giants but still work from home. He has gained recognition for unusual products which he has himself, marketed through the Direct Marketing System. As a manufacturer, His State of the Art, “Marking Device System”, has been instrumental in helping many of his students gain independence from the routine of 9 – 5 wage slavery. This system is exported worldwide and is in operation by giant organizations such as The U.S. Air force, the Canadian National Institute For The Blind and the Canadian Banknote Company. Small and large corporations, institutions and businesses are all numbered among his satisfied clientele. His tireless and unrelenting quest to help others develop their own business keeps him young in spirit and in heart. His energy is boundless and dedicated to the new entrepreneur. 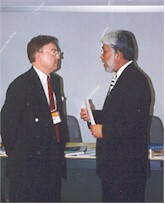 He has conducted seminars coast to coast in North America, Taiwan, Japan, Hong Kong, China and has done business in Europe and the subcontinent of India. All these experiences of over 35 years is the foundation of the evolution of this Program of building International businesses from the base up. The very pedigree of this Program reveals, without a shadow of a doubt, that it cannot be learnt in the great halls of universities and colleges. This can only be passed on from one entrepreneur to another aspiring entrepreneur. This Program has truly the claim of having dispensed with theory and built on sheer hard experiences. 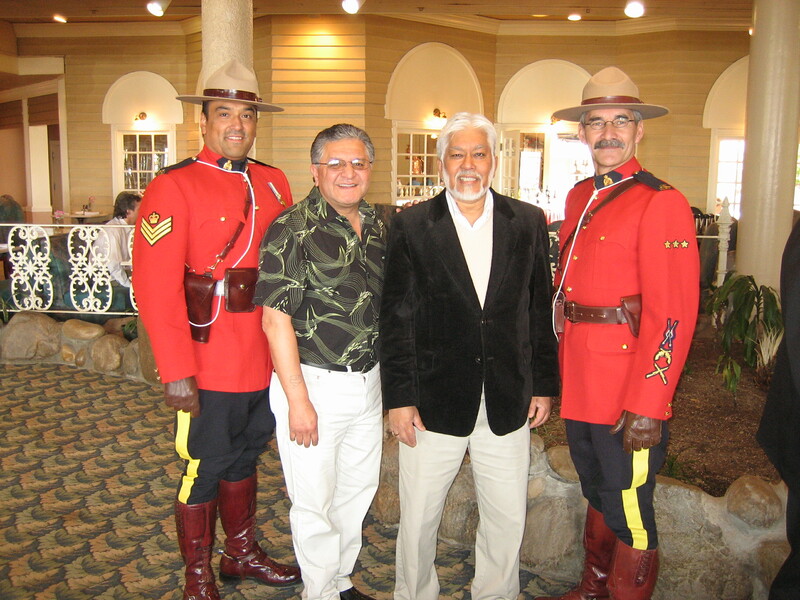 Tulshi Sen Keynote Speaker at the National Indigenous Sexual Abuse Conference in Edmonton, Alberta, Canada at the closing ceremonies with George Tuccarro, MC and present Commissioner of the Northwest Territories of Canada and the Royal Canadian Mounted Police. The foremost Elder, past Chief and Medicine Man, Rufus Goodstriker, honored Tulshi Sen with a Blackfoot Name in a Sacred Ceremony and inducted him into the “Lone Fighter clan”. 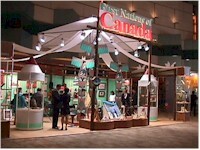 First Nations Pavilion in Hong Kong showcases First Nations Arts & Crafts from across Canada to the whole world. ...an excellent initiative and a good vehicle to develop export business for small companies and individual producers, who otherwise may have difficulty to reach this market on their own. We believe that FNITC... deserve the future support of the Department. " Mr. Sen, far right, with students negotiating prices while training on site at a Solar Products Manufacturing plant in Hong Kong. His students are from U.S.A.